Lots of people believe in ghosts and the supernatural. Heck, over 75% of the employees in our office said they believe in ghosts! DISCLAIMER: Although scary stories, paranormal pursuits, and psychics are great entertainment, so far neither ghosts nor haunted houses have been irrefutably documented. The only haunted house recognized by the US government was based on a court ruling of advertising. The probability is that the only ghosts in your neighborhood will be living people in costume celebrating Halloween. Despite this, we all have at some point in our lives told ghost stories in the dark, we love supernatural thrillers in movie theaters, and the TV show “Supernatural” has been on the air for ten years. However, our love for the unexplained may not cross over when we are living in a property we believe to be haunted or has odd things happening in it. 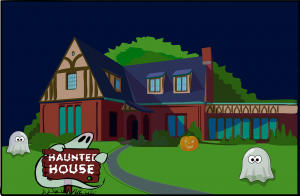 Some people have challenged, both successfully and unsuccessfully, getting out of a mortgage agreement due to their home being haunted (look up the New York case of Stambovsky v. Ackley of 1991, and Callan & Chinchilla v. Lopez 2012 case in New Jersey). There are also real estate agencies starting to accept that hauntings and other “emotional defects” on a home may need to be more closely disclosed to clients to avoid lawsuits. Google the address you are looking to purchase a home or rent an apartment at. Within the first few pages of results, you should be able to see if a murder, suicide, or other type of violent event happened on the property. It could even be a problem for some people if a car crash or another kind of disaster happened in front of the property or on the land before the home was built. Look into owning or renting a good quality EMF detector. These meters, which search for electromagnetic fields in the atmosphere, are said to be great ghost detectors. For skeptics, they serve another great purpose – humans can be sensitive to high levels of electromagnetic fields (EMF) and electromagnetic radiation (EMR). EMF detectors can show you if there is too much activity going on that can either be linked to a natural cause, or the unexplained. Either way, high levels of this activity can cause fatigue, unease, and nausea, which is what many people say they suffer from when they believe they are around ghosts. Get a good pest inspector. If there are claims of scratching within the walls, creaking, or items being misplaced from where they were originally, it is possible that some little rascals could be living in your house, and not a former dead resident. If unseen raccoons, squirrels, mice, rats, or other sizable rodents are messing around with you, this is easier to fix than dealing with ghosts. Federal Home Loan Centers is ready to take your questions on affordable and lenient mortgages backed by the USDA, VA and FHA via HUD. Please call 877-432-5626 or tweet @FedHomeLoan.